Companies such as Amazon, Microsoft, IBM, Google and Alibaba dominate Web 2.0’s open application ecosystems. Data from Synergy Research Group, published by The Economist, shows that these five companies control roughly two-thirds of worldwide cloud services. These companies are clustered in the U.S. and China, which espouse opposing principles of internet governance. As security expert Adam Segal explains in an article for Foreign Affairs, China’s strategy is “cyber-sovereignty,” whereas the U.S. largely supports a “global and open internet.” Thus, the power of Web 2.0 sits in a few companies and their national governments, though perhaps not for long. In June 2017, in an article titled Dawn of the Ultimate Unfair Competitive Advantage (Part 1), I argued that data and intelligence would distinguish the most successful companies for the next decade. Data and intelligence form an even more important unfair competitive advantage in Web 3.0. Here, we’ll examine how crypto pushes proprietary, closed datasets to gain an unfair competitive advantage by becoming open and owned by no one. Before I state the thesis, let’s define some terms. The blockchain is one manifestation of “distributed ledger technology,” known as DLT. We commonly refer to it as “crypto,” not to be confused with cryptocurrencies. In this article, “crypto” refers to all innovations that use cryptology to make transactions secure, transparent and decentralized. Crypto technologies could level the foundations of the modern web and challenge the political, financial and cultural institutions on which it depends. Web 3.0 is a second appeal to the internet’s founding ideals — the establishment of free and open access to information, connection and exchange. On Greth’s back — a metaphor for all crypto startups — we may return home to a sobering night’s sleep and an internet that would make its creators proud. Crypto innovation matters because it could reinvent capitalism. Normally, the invisible hand of the market rolls innovations into tightly packed conglomerates. The Rockefeller oil empire, Microsoft, and now Amazon, among many other examples, illustrate how conglomerates dominate an industry and disadvantage competitors. The play only backfires if, like Microsoft’s ploy with Internet Explorer, the dominant player fights unfairly and triggers antitrust investigations. As Diagram A below shows, the dominant player’s innovation follows a pattern first described by Stanford computer scientist Roy Amara. 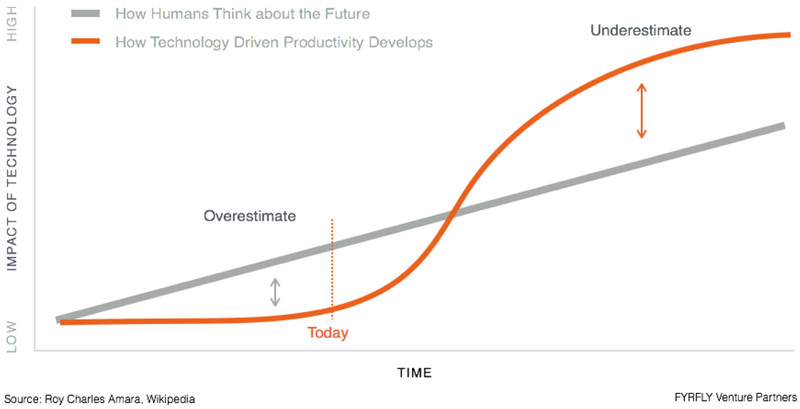 First, the technology is overhyped and overestimated. Second, as a result, the public becomes disenchanted. Third, that same technology becomes so ubiquitous and important that we can’t imagine life without it. Google, Tesla, and a short stack of other companies could control the self-driving market in 10 years. They would become the market’s “head,” the left side of Diagram B below. Startups and small businesses live in the “long tail,” the right side of the diagram where we usually find more diversity and differentiation but higher prices and less scalability. The head monopolizes the profit pools leaving little or no space for long-tail companies. Eventually, the head uses lobbying, political influence, and other forms of so-called soft power to solidify dominance. While the head drives innovation through organic and inorganic initiatives (e.g., acquisitions), it increasingly controls the market’s innovation agenda. This depresses the likelihood that innovations from the tail become mainstream. The long tail is too much of a threat to the entrenched powers, so they squelch it. The area of plurality, decentralization, and competition in the long tail lies fallow if the dominant players entrench themselves well enough. The transaction costs for, say, a mom-and-pop insurer, oil company, or telecom provider are simply too high, and head players ensure it stays that way. 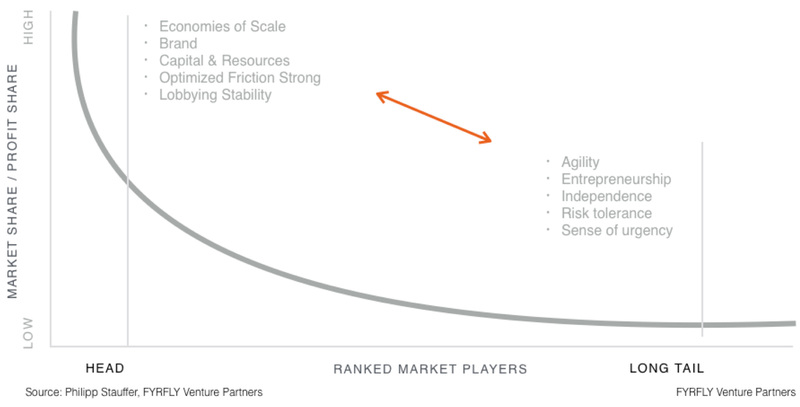 What if we could create a sustained level playing field that brings all the advantages of the head into the tail (scale, resources, brand, optimized friction, lobbying, stability) and the advantages of the tail into the head (agility, entrepreneurship, independence, risk tolerance, sense of urgency)? The analogy is sound and offers a new way to look at the article “The Nature of the Firm,” written by Ronald Coase in 1937. The Nobel Prize-winning paper argued that firms exist because they reduce the transaction costs an entrepreneur faces when operating bilaterally in the open market. Perhaps the objectives and advantages of the firm could be better achieved by technology that empowers and governs collaboration networks. With crypto platforms, multilateral webs of smart contracts amongst individuals could reduce transactions costs more efficiently than a firm, at least in theory. With technology as sophisticated as a self-driving car though, who can possibly afford to compete outside the head of the market? George Hotz, apparently. As Bloomberg reported in 2015, Hotz, then a one-man show, converted an Audi into a self-driving system in one month. Whether he was trying to beat Tesla, sell to Tesla, disrupt Mobileye or do all three is somewhat unclear. Hotz isn’t exactly modest, but perhaps you shouldn’t be if you hacked the iPhone and Sony PlayStation 3 in high school. He’s the perfect example of someone pushing a multibillion-dollar technology into the long tail, where he may — or may not — retain his competitive advantage. That will depend on who controls driving data. After running into compliance issues with the National Highway Traffic Safety Administration, Hotz pivoted his self-driving car into comma.ai, “Ghostriding for the masses.” His team created a dashcam devkit so that anyone can collect plenty of driving data. It aspires to be an open-source operating system; what Android is to phones comma.ai wants to be to cars. As a long-tail play, comma.ai seems limited, especially if you consider what Toyota is up to. Toyota, one of the world’s top three carmakers by production, announced its push into crypto with plans to pool driving data from millions of vehicles. As Chris Ballinger, former director of mobility services at Toyota Research Institute, told TechCrunch, “Hundreds of billions of miles of human driving data may be needed to develop safe and reliable autonomous vehicles.” Why would Toyota pay for someone to drive those miles when a crypto platform or underlying protocol could aggregate from tens of millions of vehicles at minimal cost? Asked about the news, comma.ai responded vaguely on Twitter: “Hmm, we are investigating blockchain technology too… #protocoltoken.” I hope they mean it. Initially, Toyota played the long-tail strategy that comma.ai ought to try. However, the Japanese carmaker couldn’t resist joining its rivals in the head of the market. On Aug. 27, Toyota announced plans to invest $500 million in Uber to mass produce autonomous vehicles. Writes the BBC, “It is being viewed as a way for both firms to catch up with rivals in the competitive driverless car market” — namely, Google’s Waymo. Will Toyota kill its blockchain initiative then? Consider that if Toyota puts the data on a public blockchain, then anyone, including competitors like comma.ai and Waymo, could tap Toyota’s driving data to make a better autonomous system. This scenario presents a great test for crypto. Will Toyota make its data open and available through crypto to level the playing field? Or will it take the data private and fight like Waymo? Either way, the case shows that anyone from a lone individual like Hotz to a powerhouse like Toyota can use crypto to ignite the long tail of autonomous driving and thereby rob Waymo of advantages it has gained by investing in millions of test-drive miles. Data becomes a great equalizer in open crypto protocols and platforms, and intelligence becomes the battleground. As in the stock market, the winner isn’t the party with the most data — the winner is the investor who analyzes common sets of data, best predicts the future, and takes appropriate action. If crypto reinvents the conventional path from innovation to dominance, we will enter a new era of the web. To understand how it’s different and why it matters, we must compare it to our past and current models, shown below in Diagram C.
The jury is still out on that claim. Either way, Web 1.0 grew centralized foundations that still served the common good. Companies like Microsoft, Oracle, Amazon, and Google controlled both the application layer and the infrastructure layer. This was inevitable because early web technology was expensive to create and maintain. Only companies with sufficient scale could afford to put horses in the race and give us access to this new technology. Web 1.0 didn’t live up to Bill Gates’s dreams. Still, it launched the modern internet. 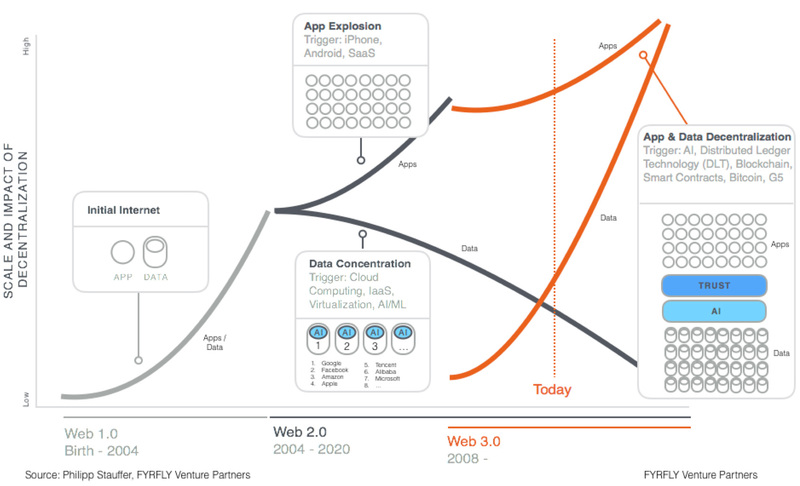 The introduction of the iPhone in 2007 marks the transition to Web 2.0. Thanks to the iPhone and App Store, soon after emulated by Google Android, anyone with the sufficient skills could produce an iOS or Android app to solve any problem at hardly any cost. The mobile revolution decentralized app development and created massive market access, demand, and adoption. However, the concentration of data and control further intensified under the banner of just a few companies, which, as I mentioned earlier, still control more than two-thirds of the cloud. That doesn’t mean those few companies do a poor job. On the contrary, they’ve provided valuable services to consumers and thousands of successful companies that grew on their platforms. Today, consumers buy roughly 1.5 billion smartphones per year to access more than 7.1 million apps available from Apple, Google, Microsoft, and Amazon combined. Apple alone has paid out more than $100 billion to its app developers since launching the App Store in 2008. Amazon Web Services, another success story, brought simplicity and a utility to computing power, triggering innovation at much lower costs and with minimal barriers to entry. AWS hasn’t announced the size of its customer base since Q1 2016 (1 million at the time), but its quarterly revenue has grown from $2.5 billion then to nearly $6.1 billion in Q2 2018. When innovators use these popular tools, artificial intelligence, and infrastructure, they centralize ‘big data’ into just a few datacenters owned by dominant players. There, the data will train the next generation of algorithms. Effectively, digital companies and their customers pay for cloud infrastructure and subsidize AI by creating all the data that nourishes it. It’s as if we drilled the wells and pumped the oil for tech companies. The terms of the deal were only clear in retrospect. That bait-and-switch helps to explain how companies like Facebook accumulated power akin to that of 20th-century propaganda ministers. Conversely, the Cambridge Analytica scandal revealed just how easily a third-party could manipulate Facebook’s privacy policies (or lack thereof) to misappropriate data. As I argued in a recent interview about Facebook, the sorcerer’s apprentice has lost his broom. The leading data players got the wakeup call and hopefully are taking action. With Web 3.0, users and developers might not think twice about taking their business away from the big tech companies that behaved recklessly with centralized data and exploited third parties. Arguably, Web 3.0 dates to the advent of bitcoin in 2008 but didn’t become much of a force until 2016. Bitcoin appears to have been a product of someone’s — or many people’s — frustration with the 2008 financial crisis. According to the popular narrative, monopolistic, unregulated bankers and insurers tanked the global economy, got bailed out by national governments, and faced no penalties or legal consequences for doing so. Instead, they got their usual bonuses while countless people lost homes, jobs, savings, etc. The securitization of everything (not unlike the tokenization of everything) backfired. By 2016, when Web 2.0 was taking flak for abuses of power and privacy, crypto had developed sufficiently to say, ‘Hey, here’s a solution.’ Crypto entered its hype phase in Amara’s Law with bitcoin as a mascot. Speculative investing in bitcoin, the billions of fiat and crypto currencies exchanged in initial coin offerings (ICOs), dubious crypto advertisements and pie-in-the-sky white papers characterized the rise of crypto — and sometimes still do. Read up on EOS’s $4 billion ICO, the largest to date, and tell me if you can explain what the organization will do. Sure, with $4 billion or crypto equivalents in the coffers, EOS might be able to find a purpose, but this doesn’t seem like a responsible and savvy way of investing. It seems like we’re on the brink of the disenchantment stage in Amara’s Law. Once the buzz and disenchantment phase pass, crypto and Web 3.0 can come of age. That matters because it could decentralize the app landscape further and, for the first time, break the trend of centralizing of data, as you can see in Diagram D. It’s a massive investment and entrepreneurial opportunity. Two scenarios are shown below. In Web 2.0, big tech pushes to create its own walled garden cloud and infrastructure services with open AI tools on top. 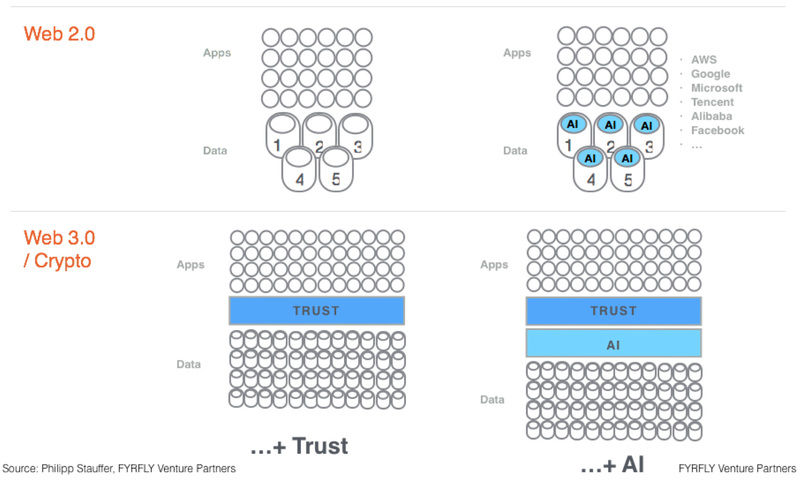 The Web 3.0 scenario, in contrast, is a truly open world that offers a trust layer and open AI on top of open data. It can fuel innovation in novel ways. Or, maybe big tech will realize that open networks are too hard to compete with and open up their walled gardens as well. In the past three years, dominant tech companies have ramped up their contributions to open-source initiatives like the Linux Foundation. Maybe they will warm up to open crypto as well. Until then, the invisible hand will try to centralize crypto but likely fail to do it. Just look at how quickly ICOs have decentralized startup investing. Last year, they raised $5.6 billion at an average of $12.7 million per project. For comparison, the total in 2016 was just $240 million. Meanwhile, global angel and seed deals raised just $8.5 billion in 2017 according to CrunchBase’s figures. Still, ICOs will have to prove that they are a successful and sustainable way of raising capital for both entrepreneurs and investors in the long run. The point is, even solidified, powerful institutions like the venture capital industry have all the staying power of a helium balloon when crypto touches their model. We VCs are no longer gatekeepers who ‘pick’ the winners and control flows of capital from the seed stage to acquisitions and IPOs. Rather, we play a bigger role in mentoring, networking and growing successful ecosystems of entrepreneurs and portfolio companies. As my partner Julie Allegro says, impact investing is the only kind left. The crypto investor may operate under new models that challenge centralization for cultural, ethical, and business reasons. But, any investor is still an investor and will take risk for an appropriate return. To summarize Web 1.0, 2.0, and 3.0, the internet was born from Jeffersonian values then evolved into a more Hamiltonian locus of power, centralization and monopoly. Until recently, most companies would launch in the long tail and vie for the head, whether by acquisition or long-term growth. With Web 3.0, staying in the long tail as a smaller, independent entity is feasible. A company can collaborate within an open network and community with its own mechanism of incentivization (tokens) and self-governance. Such a system might spur more productivity and meritocracy and therefore drive more successful innovation and profit pools in the future. Those who create value in this system all rise with the tide; those that extract or erode value get ejected. The crypto revolution may give the internet’s democratization narrative a second chance. Web 3.0 could renew the internet’s early aspirations to democratize creation, information, connection, and innovation. It is a threat to both the technology giants who horde data and the political institutions that foster monopolies. 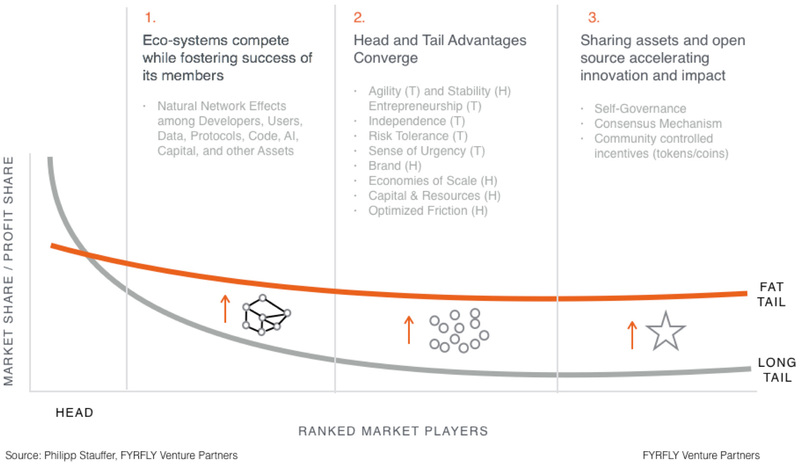 Most likely, crypto will set up collaboration ecosystems and communities in the long tail rather than destroy and supplant the head. Some startups will continue to create proprietary, closed ecosystems. Big tech will, to varying degrees, include crypto technologies in its mix. In the same way cloud services split into private, public and hybrid options, expect crypto to follow a similar route. The private and hybrid options will keep the walled gardens walled. And what of the AI layers? Google, Amazon, and Microsoft have built their own AI on clouds that make quite an attractive package. It’s not easy enough for innovators to launch on the blockchain and depend on open-source AIs — at least not yet. Perhaps the future is less about companies competing and more about ecosystems competing. Within each ecosystem, there could be distributed applications, AI and infrastructure layers. Some ecosystems might intermesh and pool data, and others might stand alone. But, much like in Men in Black, the sci-fi comedy with Will Smith and Tommy Lee Jones, the ecosystems may be just little galaxies within bigger galaxies — little tech within big tech. Decentralized ecosystems might expand into a universe still controlled by the centralized web. Still, when you speak to innovators in crypto centers like Zug, the optimism is contagious. The cultural underpinnings of these startups suggest that they will not settle for a Web 3.0 that gets yoked by big tech. They are promoting a form of ‘little tech’ that will not sell out or compromise its values. In the meantime, we can add an addendum to the Ultimate Unfair Competitive Advantage: the data and intelligence protocols and platforms that establish openness via crypto will gain advantages over the protocols and platforms that restrict flows of data and access to it. Simply put, crypto will give platforms the ability to collect more data, power innovation in the untapped long tail, and ultimately train better AI algorithms. The implication is that a growing “Fat Tail” will reshape the competitive game depicted in Diagram E.
In the Fat Tail, crypto replicates the benefits of the firm, potentially making it obsolete. Individuals (or small entities) reject corporate life for a fluid market defined by decentralized mechanisms for distributing talent and resources, rewarding work and gauging merit. The Fat Tail becomes the best of both worlds: long tail dynamism with the economies of scale, resources, optimized friction, lobbying and stability an ecosystem can provide. The sharing of protocols, code, data and other assets drive the growth, productivity and utility of the Fat Tail. The open source movement — and even the market participants who try to prevent the emergence of open-source crypto — will both benefit if self-governance and trust mechanics prove to be scalable. Overall, we will gain in productivity and unleash innovation at a faster pace. If the Fat Tail emerges, Web 3.0 may sober up a hungover internet ecosystem that, unwittingly, gave too much power and influence away to too few tech companies. Web 3.0 will be a reinvention of capitalism if this thesis proves correct. The result could invent new value chains and, to borrow the Silicon Valley cliché, make our world a better place. However, with new freedom and choice comes responsibility. Over the next 10 years, technology will cut deep into our social fabric and awaken civilizational challenges that seemed settled for more than 100 years. Welcome to a new and more sober internet. Wharton professor Kevin Werbach explains why the blockchain is poised to upend the way many industries do business. I was curious if you had an experience using AWS or Azure(Microsoft’s cloud)? If you have proprietary data in AWS, Amazon is not running AI algorithms on your data just because you are storing it in their ecosystem. All they do is provide the infrastructure. Which they built and maintain, and give you access to scale infinitely with a few clicks. When you say, “Effectively, digital companies and their customers pay for cloud infrastructure and subsidize AI by creating all the data that nourishes it. It’s as if we drilled the wells and pumped the oil for tech companies” you have the metaphor completely backwards. In reality, cloud companies like Amazon and Microsoft (not Facebook, they do not provide cloud infrastructure) paid for all the drilling equipment, maintain the equipment, let you rent as much or as little equipment for as long or as short a time period as you like and you can take it and drill anywhere you want without the upfront cost of all the drilling equipment. You so you know, I do not work for any cloud companies. Thanks – hopefully this article shows the next nails in the coffin of centralization – very #decent!